The Bolognese are highly intelligent but yet comical in their demeanor. Almost everything I have ever read about them says they are a serious dog. Have they met one? The Bolognese is not as much of a clown as lets say the Havanese or the Bichon Frisé but we are still talking clownish just the same. Do not take their clownish demeanour for stupidity either; they know just how to work a crowd and make adoring fans out of each of them all. The whole ‘chasing my tail’ thing usually is a sign of lacking brain cells with most breeds but I have seem the Bolognese do this as an attention grabber, this technique usually wins a few treats from their adoring on-lookers. Not enough can ever be said for their intelligence; this can be a blessing for their owners or a curse and it all depends on how you want to look at it. They make great dogs for canine sports like obedience, agility, and fly ball because they are so easy and quick to teach them new tricks or commands. This brief breed profile of the Bolognese was provided by Juanita Heidebrecht. 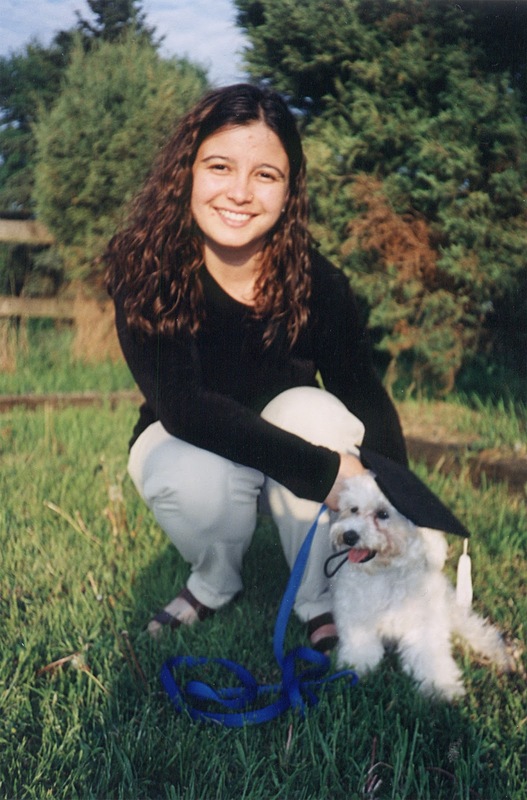 A dog lover and enthusiast of the Bolognese breed, who was an active board member of the Bolognese Club of Canada. The Bichon Bolognese is first and foremost a ‘people-dog’ as in ‘people-person’. They love their owners and if they had their choice would never be without them. They love all people actually and can be great companion dogs because of it. The Bolognese are good with children but the children should be old enough to know how to be gentle with small dogs. 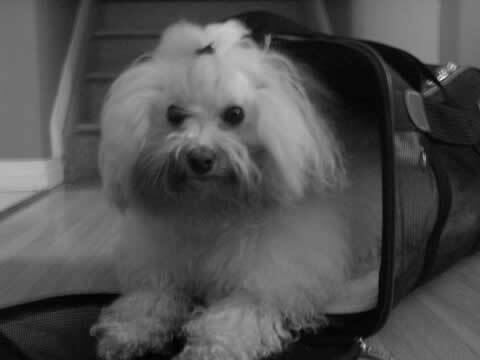 The Bichon Bolognese are highly intelligent problem solvers but yet comical in their demeanour; and always cheerful. Almost everything I have ever read about them says they are a serious dog. Have they met one? The Bolognese is not as much of a clown as lets say the Havanese or the Bichon Frisé but we are still talking clownish just the same. Don’t take their clownish demeanour for stupidity either; they know just how to work a crowd and make adoring fans out of them all. The whole ‘chasing my tail’ thing usually is a sign of lacking brain cells with most breeds but I have seem the Bolognese do this as attention grabbers, this technique usually wins a few treats from their adoring on-lookers. Not enough can ever be said for their intelligence; this can be a blessing for their owners or a curse and it all depends on how you look it. To train new tricks or commands takes less time than other breeds. They make great dogs for canine sports like obedience, agility, free-style dance, and fly-ball because they are so easy and quick to train. The down side of their intelligence is that they can be easily bored which can lead to behavioural problems and property destruction just like any other intelligent breed. Their cheerfulness is what really sets the Bolognese apart from any other breeds. I swear they are constantly smiling. They are also outgoing and never shy about meeting new people. Though they are ‘minimum exercise’ dogs they are sturdy enough to handle an afternoon of exercise like a hike threw the woods or an afternoon of sidewalk shopping. 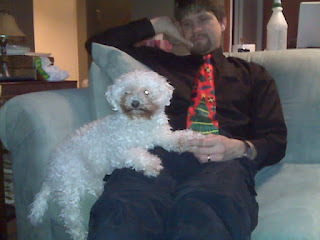 To sum up: The Bichon Bolognese are highly intelligent, comical, clownish, cheerful, outgoing, and happy dogs. Traveling with your dog can be fun for both you and your dog; and being prepared provides for those opportunities in fun. If you are traveling via car or via plane, you should get yourself a hard plastic crate. I am not going to go over the specifics of which one you should get. Ideally you should visit the websites of airline carriers you often use to review their specific requirements about the size of crate you should get or your dog. Get one to the specifications of the airlines for your dog and do not try to use one bigger than required for your dog's comfort. Staff may spot it and deny your dog passage. Something to think about. Chances are most airline flights you will being taking with your dog will be within your own country and you will find the requirements between national and international flights are slightly different. Most of the time, airlines will only require ventilation holes, besides the wire gate/door at the front, only on the sides of the crate and not in the back. Most international flights will also require holes in the back as well. If you are in the situation where your crate meets the requirement for national flights and require the extra holes in the back as well. Save money and drill holes in the back of crate. File the edges and it should now meet the international requirements. And, there should be no reason why the same crate could not still be used for all your regular flights. Regarding water in a water dish, check with your airline for specific details. Most will let you provide water for the dog. If that is the case, I recommend freezing a big block of ice (that will fit in the dish) so it is less messy for your dog and lasts longer. Make sure to get "Live Animal" stickers for your crate when traveling by air and put them on. If you have a small dog and a small dog airline approved carry-on bag, and your airlines is ok with bringing your dog with you on the plane, bring along pre-printed sheets of paper and tape with you with the words "No Animal inside" or "This crate contains no live animal". This way your dog goes along with you and you can fill-up the crate with stuff to take home; plus you will not be charge an extra fee for live animal in the cargo. When I travel with one of my small dogs on a plane, I might take an airline approved carry-on bag and a hard plastic crate as well. 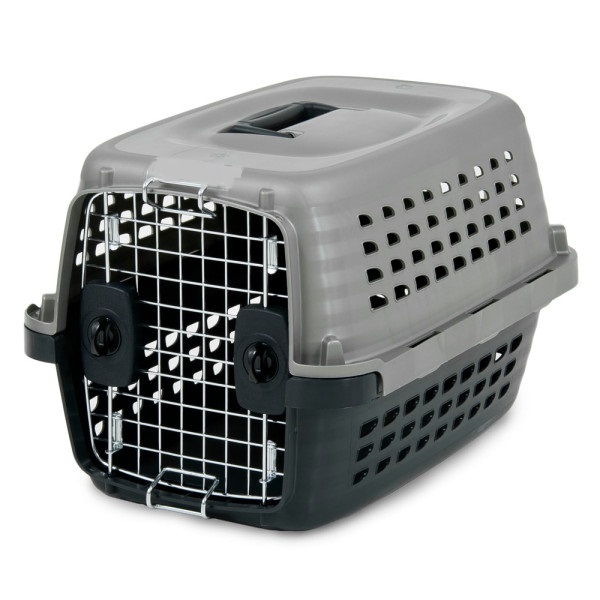 The plastic crate will serve many purposes: a crate when the dog cannot be supervised, a crate for the night, a crate when traveling in a vehicle, and on the plane. And what if you are only planning on traveling by car? I would highly recommend using a hard plastic crate as well. There are countless stories of people who might only use a wire-mesh crate, if they use anything at all, to later see how their light wire-mesh crate crumpled up after a car accident. Chances are your dog may not survive a car crash with a wire-mesh crate. Something to think about the next time you hop into your car with your dog. What Kind of Crate should I get for my dog? When getting a crate for a puppy who you may be trying to housetrain, you will need to get one that will be just the right size for your dog to only provide just enough space for a comfortable sleep and nothing else. 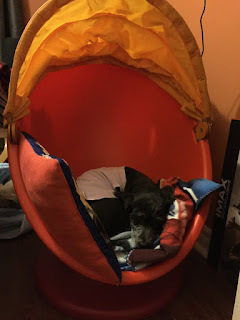 A wire crate, with a light blanket or towel thrown over top, usually is an ideal crate for dogs because they provide the most ventilation and can be more versatile than the hard plastic kind normally primarily used for traveling. Most wire crates come with a divider these days and I would lightly recommend getting a crate which comes with a moveable divider. Find out what the approximate height of the dog should be when then dog is full grown. You will need the overall height, from the floor to the top of the dog's head and this will give you an idea of how high the crate needs to be. And, find out the height from the floor to his shoulder's, this will give you an approximate wide you will need for the crate. Crates are an essential accessory for dogs throughout their lives and if you want to save some money by not having to purchase two crates, I would recommend getting a crate one size larger than what you really need for housetraining. Read more about how crates are not just for housetraining. 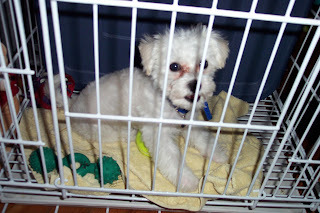 Use the divider to reduce the available room in the crate for the dog for housetraining purposes. Read more about housetraining your puppy. 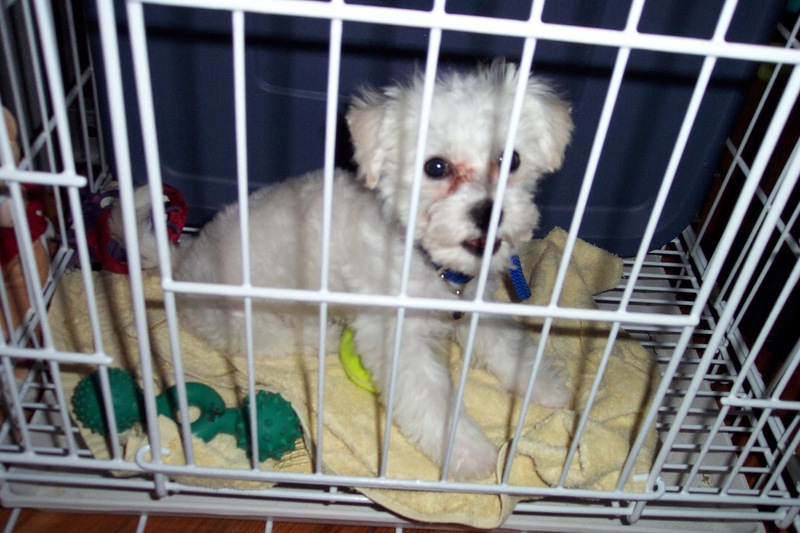 Avoid crates with a wire mesh on the bottom of the crate above a pull-out tray. 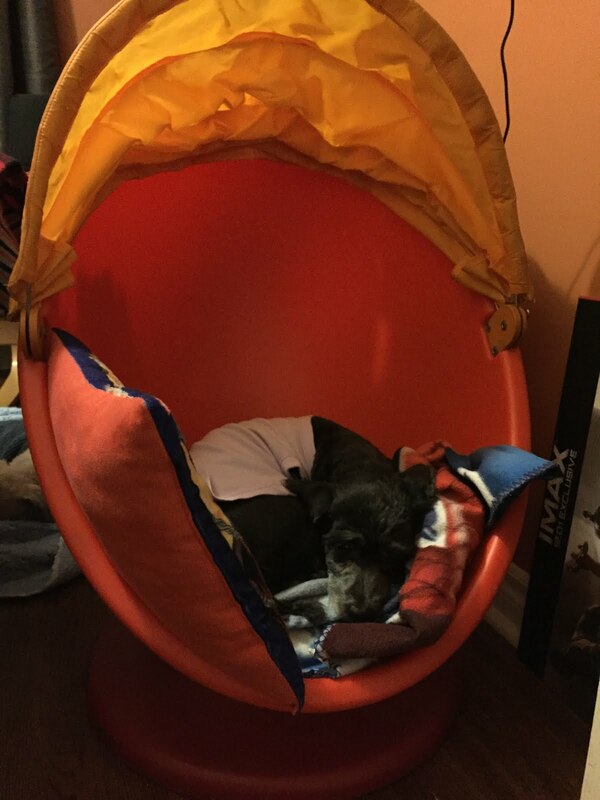 For one, in order to use them you need a thick blanket on the bottom so it is comfortable for the dog. And two, the wire mesh serves no other purpose other than to let liquid and solid waste fall onto the tray. These types of wire crates will hinder your efforts in trying to housetrain your dog and frankly are uncomfortable without a thick blanket. I got one many years ago (see image with the white dog (Bolognese)) and I had regretted my purchase. Get a crate with a removable divider for house training. Make sure it has a removable tray for easy cleaning. Second side door is completely optional but it may come in handy later (in years to come) on depending on how you want to set up and use the crate. Plastic coated usually look great when you first get them but generally the plastic falls off after years of use. The Bichon Bolognese is a rare Italian breed only recognized by the European Kennel Clubs under FCI (Fédération Cynologique Internationale)and the Kennel Club of Great Britain and are recognized in the United States by the American Rare Breed Association and the United Kennel Club. As of April 2004, they are listed with the American Kennel Club under their Foundation Stock Service Program. Canadian Kennel Club gives the Bolognese a notable mention. They are members of the Bichon family; members include the ever popular Bichon Frisé, the clownish Havanese, the darling Maltese, the very rare Tvetnaya Bolonka, and some say the Lowchen as well. They were given as gifts between nobility and royalty as far back as the 11th century and gain much popular in Bologna Italy which they were named after. The Bolognese was almost extinct after WWII. They are one of the most delightful breeds you'll ever meet: always happy and always smiling; though they tend to be more thoughtful in nature and demanding at times. The Bolognese are an adaptable breed; they are able to live comfortably in the country, urban settings, as well as apartment buildings. Their exercise requirements are minimal but like any small breed, good walks during the day are both healthy for them and keep them out of trouble due to boredom. They are a very smart breed so training is a must, but be careful of repetitive style training because they will bore easily. The Bolognese have a double coat meaning they have both a light long hair that keeps growing and an undercoat. Their grooming needs are high. Many owners choose to keep their coats short, though if you remove the undercoat by grooming them daily their light and long coat will aid in keeping them cool during summer months. The Bolognese are also a hypo-allergic breed. There seems to be some misunderstanding about crates and not just among new dog owners. There are some people who feel crates are cruel. If people used a crate at all, then I often hear "my dog is house trained and we no longer need a crate anymore". Dogs are not little humans and we need to stop thinking of them in terms if we would like it or not and therefore they are not going to like it either. Dogs are dogs, and they have their own behaviours and understanding of the world around them. To a dog, a crate in many ways represent a cave like environment and their safe place, their home if I may. Dogs if at all possible would not want to soil in their home, hence why using a crate for the purposes of housebreaking a dog can be so effective. Just like you have a favourite spot in your home and this spot can be often considered "your spot", the crate is "their spot". A crate should really be a must have for any dog. A wire crate works just fine. It is best to have a crate in or near your bedroom for sleeping and for when your dog cannot be supervised. When the situation changes at your house, like a big gathering of people or a party, and the situation gets too much for your dog, the crate can be their oasis away from the temporary disruption. Depending on the size of your home, moving your crate over to the busy area provides a nice break area for your dog close to gathering. Some choose to have two crates in their homes: one near or in the bedroom and an occasional one near busy areas. Their crate should never be used as a form of punishment and they also should not be left in crate for too long. Either situations can lead to putty accidents and /or behavioural issues. A full-grown, housetrained dog can comfortably stay in their crates up to eight hours. Puppies and sick dogs need to be more frequent outings, link coming. When used correctly, crates can be very handy and a safe, comfy place just for your dog.